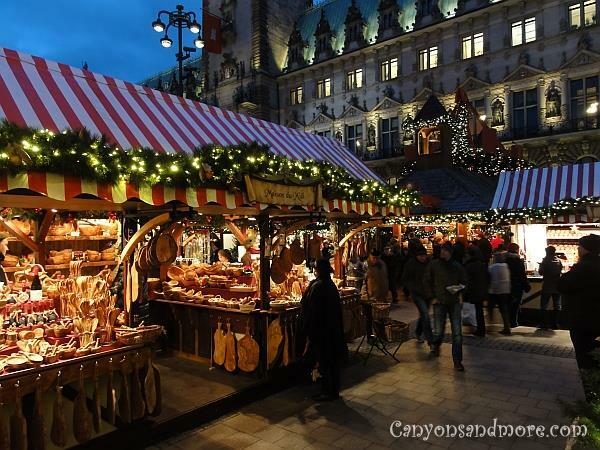 Mostly everyone who has been to Germany is familiar with the Christmas markets in Nürnberg and Frankfurt and and they are really amazing. 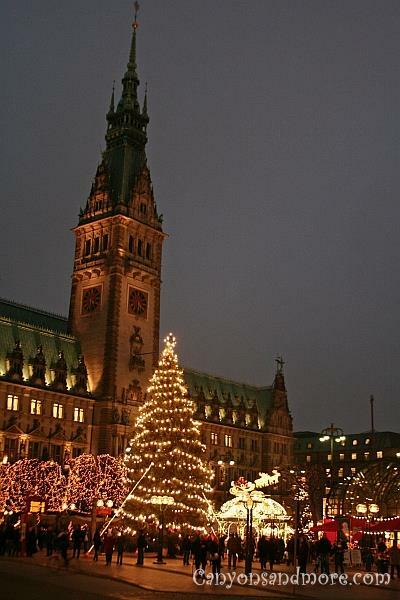 But the Hamburg Christmas market is just as exciting to visit. Hamburg is a beautiful city located on the Elbe River in north Germany which extends out to the North Sea. 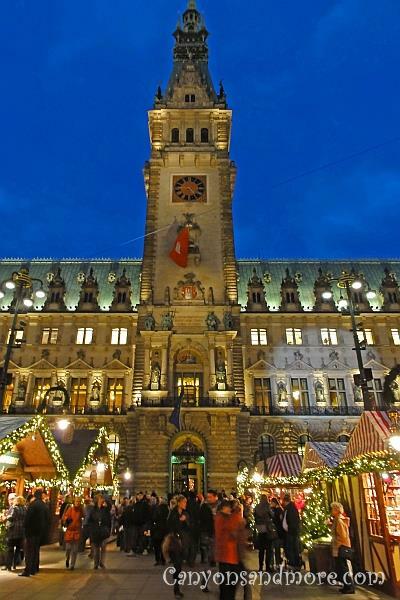 Its maritime flair is famous in Germany. The Rathaus (the city hall building overlooking the market square) itself is majestic in its own way and serves as a gorgeous background for this market. The market is set up in a sort of medival way with wooden booths and signs written in an ancient cursive which gives it an old world charm. You will surely find a special gift for anyone there. It is a charming market and attracts thousands of visitors each year. 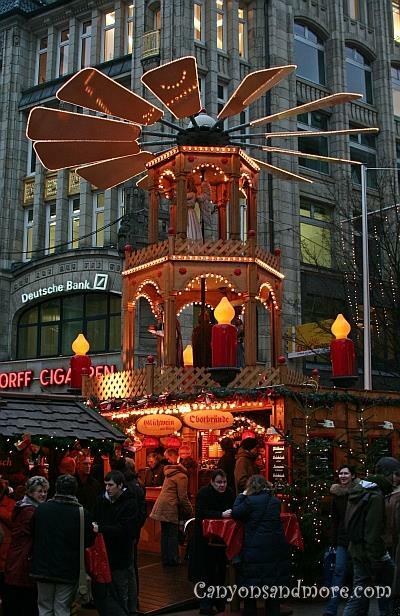 Hamburg is also home to several other smaller Christmas markets, a couple which are also in walking distance from this main one. 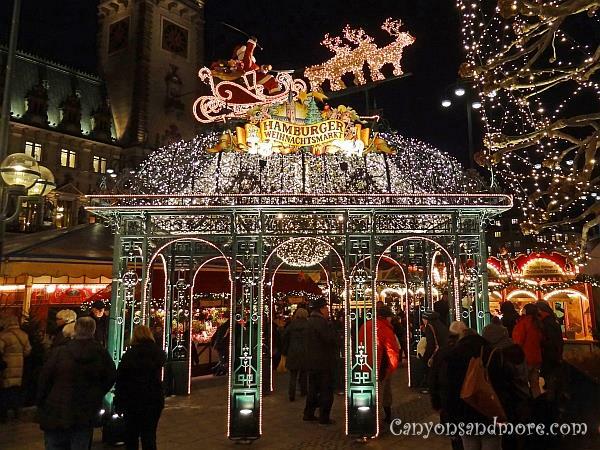 A popular one is just across the Binnenalster (a manmade lake in heart of the city) is well lit with white tents and also has lots of eating possibilities and gifts you can buy. Also along the Mönkebergstrasse and Spitalerstrasse are stalls as well. 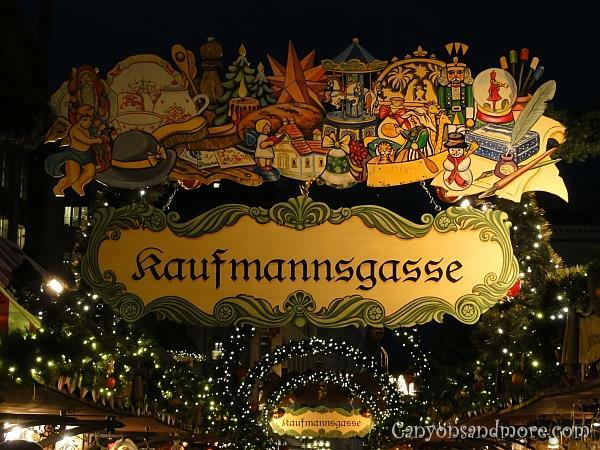 The image above is the front entrance of the Hamburg Christmas Market. 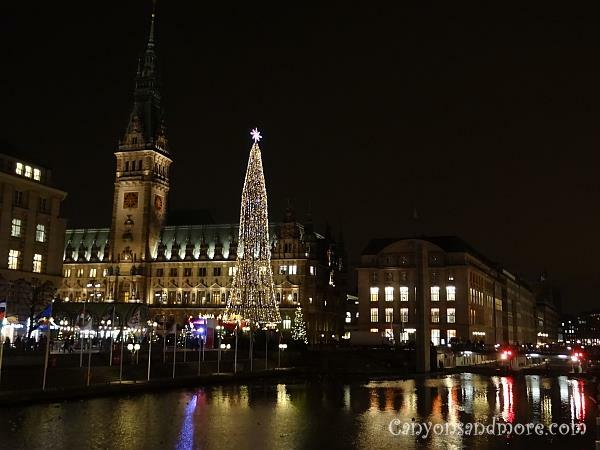 The view of the Rathaus is grandiose, especially at night when the market is festively lit up. The entrance to the market lets you feel like you are walking under a sky of twinkling lights. The Rathaus itself is a striking building full of details. 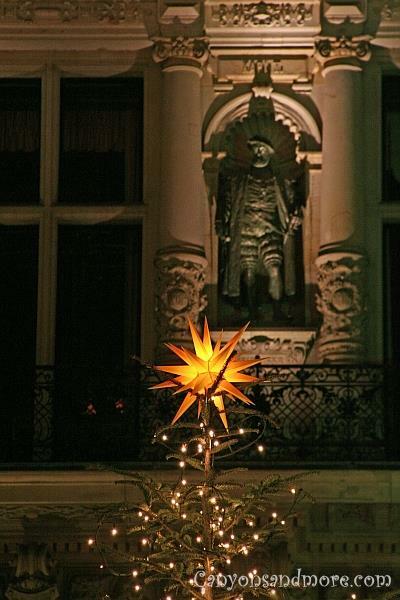 Even in Germany, “Santa” arrives for the kids just in time for the 6th of December, which is St. Nikolaus Day. 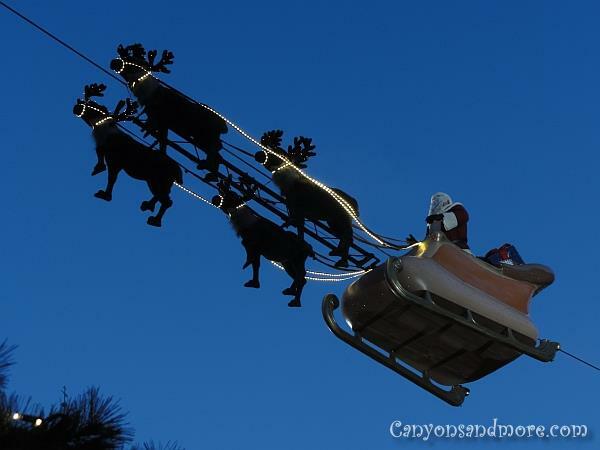 This sleigh with a Santa and 4 reindeer flew directly over the market. Traditionally the religious St. Nikolaus appears on this day and is dressed in typical traditional clothing, but the Santa figure has made its way to this country as well. The stalls offer possibilities to find the perfect gift for just about anyone on your list. Many of the booths offer handmade items which makes the market even more attractive. There were tables set up at this location to have a bite to eat. What a awe-inspiring and grand view. The “alleys” of the market are conveniently and decoratively divided into names such as Kaufmannsgasse (Merchant Alley, Handwerkergasse (Craftsmen Alley), Spielzeuggasse (Toy Alley) and Spezialitätengasse (Specialties Alley). Each of the alleys offer just what the sign says. This the market from a distance with the Binnenalster (a lake in the Hamburg city) in front. 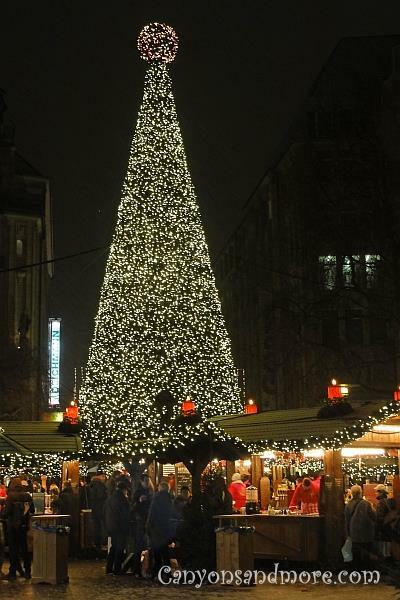 This beautifully lit tree is found in the city amongst more Christmas market booths. Where you find a wooden pyramid, you will find something to drink. This one is not located at the market, but in the city itself. The blades of the pyramid also turn so that you may see all of the figures inside of it.